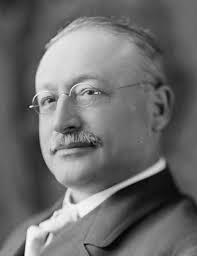 Today in Masonic History Victor Luitpold Berger passes away in 1929. Victor Luitpold Berger was an American politician and political leader. Berger was born in Nieder-Rehbach, Austria-Hungary which is modern day Romania. Prior to immigrating to the United States in 1878 with his parents, Berger attended major universities in Budapest and Vienna. Initially the family would settle in Bridgeport, Connecticut. In 1881, Berger would move to Milwaukee, Wisconsin. There he would joined the Socialist Labor Party and become the editor of two newspapers, the Social Democratic Herald and the Milwaukee Leader. He would also teach German in the local public schools. In 1896, Berger was a delegate for the People's Party convention in St. Louis, Missouri. The following year he would become the founding member of the Social Democracy of America organization. In 1898 the group would split and the "political action" wing of the group would become the Socialist Democratic Party of America (SDP). In 1901, Berger became a founder of the Socialist Part of America. He was considered the party's leading revisionist Marxists. Berger ran for Congress in the 1904, which was unsuccessful and again in 1910 when he was elected to the United States Congress. In Congress, he would focus on issues relating to the District of Columbia. He would also push several radical ideas including getting rid of the Presidential veto, abolishing the Senate and the social takeover of major industries. He gain national attention for his old-age pension bill. He would also argue for the takeover of all radio-wireless systems. His proposal on radio-wireless systems came shortly after the sinking of the Titanic. He would argue that radio signals controlled by the government would have helped prevent the catastrophe. He would serve only one term until 1912. During World War I the United States passed the Espionage Act of 1917. Berger, became a target because of his political views. He and 4 other socialists were convicted under the Espionage Act and sentenced to 20 years in Prison. Despite being convicted, Berger would be elected to the United States Senate, although a special committee would prevent him from being seated. After a new election, Berger would win again and would again be denied his seat and the Senate would declare his seat vacated. In 1921, Berger's conviction was overturned by Supreme Court. From 1922 to 1926, Berger would serve in the United States Senate. He would propose an old-age pension bill, unemployment insurance and public housing. He would also support recognition of the Soviet Union. Berger would pass away when he was struck by a streetcar crossing the street. Berger was a member of Aurora Lodge No. 30 in Whitefish Bay, Wisconsin.